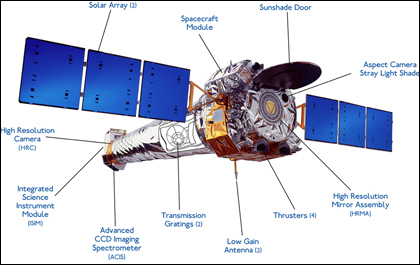 Since its launch on July 23, 1999, the Chandra X-ray Observatory has been NASA's flagship mission for X-ray astronomy, taking its place in the fleet of "Great Observatories." NASA's Chandra X-ray Observatory is a telescope specially designed to detect X-ray emission from very hot regions of the Universe such as exploded stars, clusters of galaxies, and matter around black holes. Because X-rays are absorbed by Earth's atmosphere, Chandra must orbit above it, up to an altitude of 139,000 km (86,500 mi) in space. The Smithsonian's Astrophysical Observatory in Cambridge, MA, hosts the Chandra X-ray Center which operates the satellite, processes the data, and distributes it to scientists around the world for analysis. The Center maintains an extensive public web site about the science results and an education program. Chandra carries four very sensitive mirrors nested inside each other. The energetic X-rays strike the insides of the hollow shells and are focussed onto electronic detectors at the end of the 9.2- m (30-ft.) optical bench. 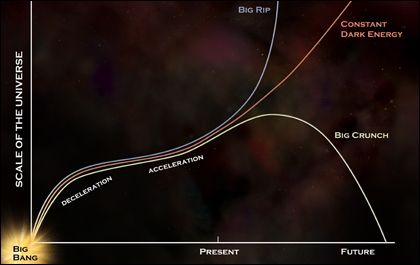 Depending on which detector is used, very detailed images or spectra of the cosmic source can be made and analyzed. Chandra's elliptical orbit takes the spacecraft to an altitude of approximately 139,000 km (86,500 mi) -- more than a third of the distance to the Moon. Find out the current position of Chandra in relation to the surface of the Earth from NASA/JPL's Eyes on the Solar System applet. 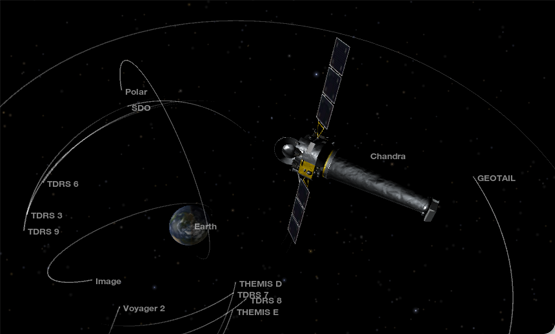 Our Satellite Tracking Tutorial also shows you just what the Chandra orbit looks like. The Observatory has three major parts: (1) the X-ray telescope, whose mirrors focus X-rays from celestial objects; (2) the science instruments which record the X-rays so that X-ray images can be produced and analyzed; and (3) the spacecraft, which provides the environment necessary for the telescope and the instruments to work. 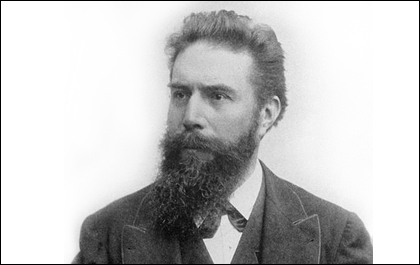 A new form of radiation was discovered in 1895 by Wilhelm Roentgen, a German physicist. He called it X-radiation to denote its unknown nature. This mysterious radiation had the ability to pass through many materials that absorb visible light. X-rays also have the ability to knock electrons loose from atoms. Over the years these exceptional properties have made X-rays useful in many fields, such as medicine and research into the nature of the atom. The word light usually makes one think of the colors of the rainbow or light from the Sun or a lamp. This light, however, is only one type of electromagnetic radiation. Electromagnetic radiation comes in a range of energies, known as the electromagnetic spectrum. 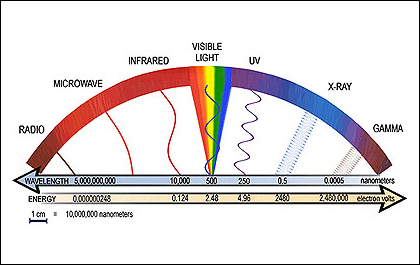 The spectrum consists of radiation such as gamma rays, x-rays, ultraviolet, visible, infrared and radio. 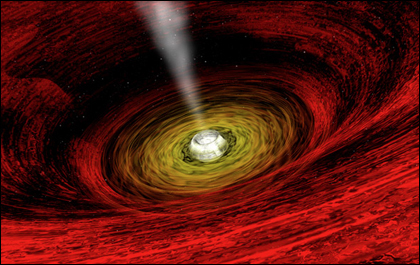 A blackhole is a dense, compact object whose gravitational pull is so strong that - within a certain distance of it - nothing can escape, not even light. 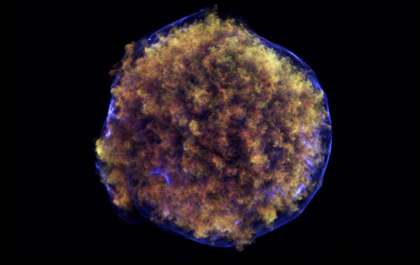 A supernova is the explosive death of a star, caused by the sudden onset of nuclear burning in a white dwarf star, or gravitational collapse of the core of massive star followed by a shock wave that disrupts the star. Dark matter is a term used to describe matter that can be inferred to exist from its gravitational effects, but does not emit or absorb detectable amounts of light. 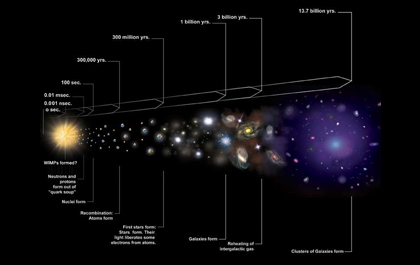 Dark energy is a hypothetical form of energy that permeates all space and exerts a negative pressure that causes the universe to expand at an ever-increasing rate. Download Chandra images suitable for 4K UHD (ultra high definition) format. 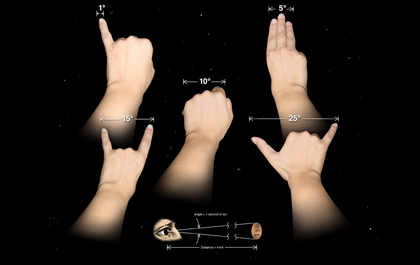 What X-ray astronomy has done for us on the ground.